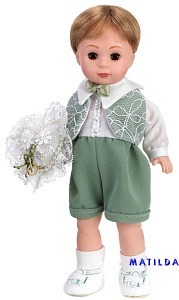 8" Wedding Rings Ring Bearer is dressed in a white, long sleeved tuxedo shirt with green shorts and a green lace vest. He walks down the aisle carrying the ring on a white satin, lace edged pillow. He has blonde hair. Retired item - available for limited time.